When I moved to Los Angeles over a decade ago, the only Wilshire I knew was the one I’d drive to get to Santa Monica: traveling through Beverly Hills’ tourist-trodden retail and Westwood’s Condo Canyon until it dead-ended at the Pacific Ocean. But in the intervening years, as I began to bus, bike and walk more, I slowly got introduced to the eastern half of Wilshire. Home some of the city’s densest and most diverse neighborhoods, plus some pretty exciting and innovative transit projects (hello, BRT lanes! ), this end of Wilshire has quickly become one of my favorite places in the city to explore. It’s also one of the most interesting streets, history-wise, as the “Millionaire Socialist” Henry Gaylord Wilshire originally donated the land to the city with the stipulation that it be the first LA street designed exclusively for cars. On a sunny April day (National Walking Day, in fact), I walked the first half of Wilshire, from its start in downtown to Fairfax Avenue, to see what this six-mile stretch of street could tell us about what kind of city we live in today. I recorded sound at 59 stops along the way (including interviewing 10 local residents), and took dozens of photos in an attempt to capture an “audio snapshot” of the boulevard. I also mapped all the photos and linked all the interviews to their photos and locations, so you should be able to get more information about any place I recorded or photographed. I then composed a poem (download here, text below, with links to more audio) that summarized my feelings in rhyme. My story is part of a series of downloadable podcasts curated by the great Edward Lifson as part of the Getty’s Pacific Standard Time Presents to celebrate CicLAvia’s Iconic Wilshire Boulevard event, where those very same six miles of streets will be open for walking, biking and architecture-gawking on Sunday, June 23. I sadly, will not be in town for this CicLAvia, so I hope to have turned my adventure into a kind of walking guide so you can experience all the weird and wonderful Wilshire I discovered along the way. If you are planning on walking CicLAvia, Los Angeles Walks will be leading a WalkLAvia from Wilshire and Grand starting at 9:00 a.m. UPDATE: Here are details for 2014’s WalkLAvia. And of course this information does not expire after CicLAvia, it can be used anytime, and I’d love to hear what else you stumble upon out there. Enjoy! 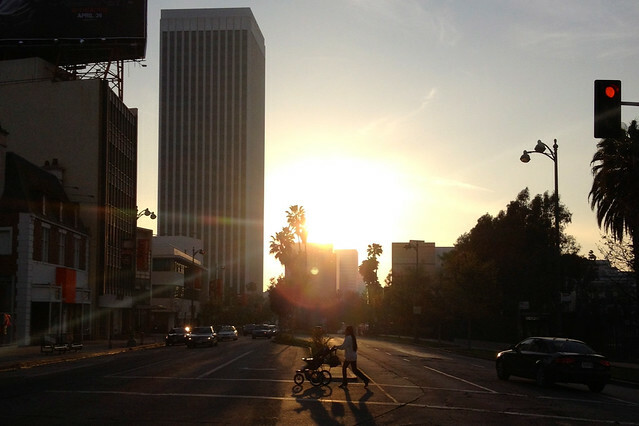 But now Wilshire is at the crossroads of a quickly changing L.A. Walking in Los Angeles? Who does it?